When I get back to the car safely after a long and tiring walk in the hills I remove my shoes, pour myself tea from my flask, and then I sit down in the open car boot. This is my quiet meditative moment before driving home when I reflect on the walk I’ve just had, breathe deeply and soak up the atmosphere one last time. And that’s when it appears. Sometimes it does so from the extremes of my peripheral vision, other times it seems to materialise from nowhere right in front of me. But wherever it comes from it brazenly invades my personal space with an air of entitlement and authority completely out of proportion to its size. It’s a robin, that familiar plump sphere of brown adorned with a splendid red bib atop spindly legs. Many people probably associate robins with gardens or woodland walks but for me it will forever be a bird of highland car parks. Unlike most birds its size my robin shows little or no fear of humans as it ceaselessly flits about on the ground just a metre or so in front of me. I get the distinct impression that its agitated dance is a canny way of getting my attention, but it needn’t worry. I’m captivated from the moment it takes to its stage. I reward its performance with crumbs of cake left over in my rucksack and then, more often than not, I talk to it. I invite it over and try to entice it onto my hand. No robin has ever shown me that level of trust but I’ve had a few of them sit on my feet, which after a long sweaty day in the hills must be a greater evil than perching on my hand, surely? 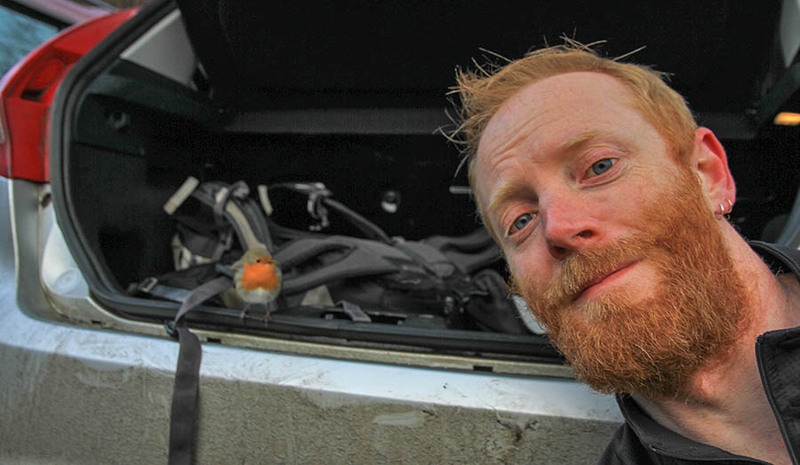 One particular robin at the Ben Venue car park had an obvious car fixation and, as I sat in the boot with my legs dangling over the edge, it flew up and joined me. There, side by side in the car park, we nibbled the remains of my fruit cake. Robin selfie! My cheery hill spirit sharing my boot space at the Ben Venue car park. Communing with a robin doesn’t happen on every trip of course but in the colder months it’s as much a personal ritual as putting my boots on in the morning. Clearly It’s not the same robin in every car park, although the identical behaviour displayed again and again by different birds in different car parks leaves me wondering. I don’t know how much thought any of us really devote to this wee bird and to pondering why it is so tame, but as with most ubiquitous creatures that are too easily taken for granted, the robin’s long association with humans means it has an interesting story to tell. Robins at our feet are of course in pursuit of food. They know full well that a car park full of gore-tex is an ‘all you can eat’ buffet serving up pork pies, cake, fruit, nuts and cheesy wotsits, all washed down with lashings of Irn Bru. Sparrows, crows and gulls display similar behaviour around our consumer waste but the robin’s interest in us goes beyond that. It’s believed to stem from us unwittingly performing a similar ecological function to the animals that it evolved alongside, and upon which it depended for finding its food. Large animals like boar and bears would have foraged the forest floor, thereby churning up the soil to reveal the grubs, worms and insects that robins love to eat. The robin learnt to follow its pals around the woodland until, that is, we drove them to extinction. But as we went about our business thereafter we performed the same service by disturbing the ground, felling the forest and tilling the soil, and so the robin learned to follow the human pigs instead. So the story goes. Interestingly the robin’s continental cousins are not so tame. There, they are predominantly woodland birds and have less contact with humans, but they also have a long history of being caged as songbirds or trapped for food, so they are understandably wary of humans. Back here, our long tradition of feeding garden birds has undoubtedly solidified our bond, and robins are steadfast in their devotion to a generous food source. That no doubt inspired this Christmas’s outrageously sentimental (but quite wonderful) Waitrose advert in which a robin migrates from Scandinavia to the UK. Its journey crosses mountains, arctic wastes and the sea, during which it evades hungry predators and is saved from drowning by some caring North Sea fishermen. And for what? Well obviously it’s all for a Waitrose mince pie left on a bird table by a British child. Schmaltzy, yes, but the advert was praised for its depiction of the perils of species migration, especially for small birds such as the robin who cannot fly at high altitudes like geese to avoid danger. 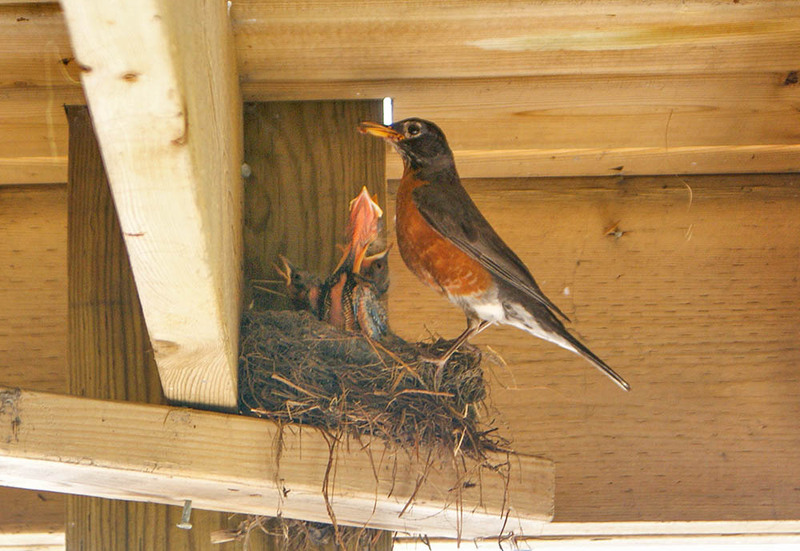 The North American robin is a thrush and not closely related to the European species. You might be surprised to hear that robins migrate here from other parts of Europe, but the bird has a wide distribution across the whole continent from Africa to Asia. At this point though, I feel I should point out for our North American readership that the robin we see in Europe is not the same one you see in the US and Canada. Your red-breasted robin is a type of thrush, much larger than our robin, and was so-named because of its superficially similar colouring. 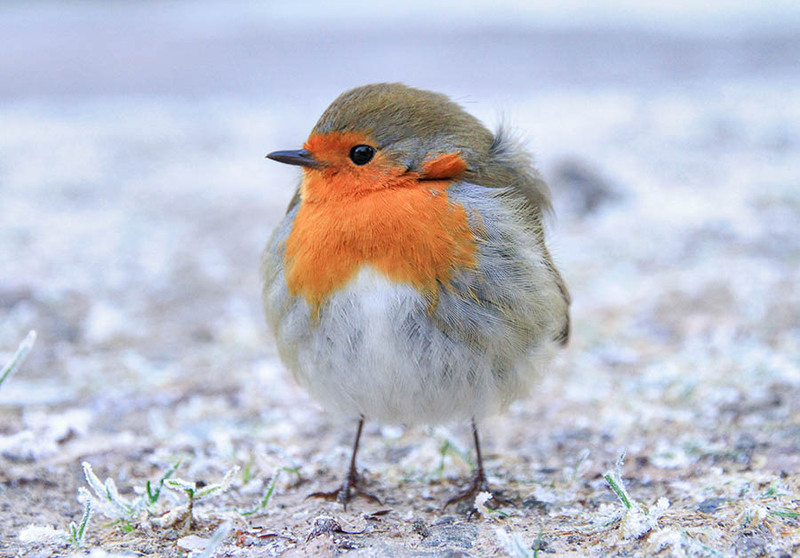 While a number of northern European robins do migrate south to the UK in autumn, and while some British robins seek warmer climes over the Channel in winter, the vast majority of British robins are non-migratory and stay put all year round. Because many other summer migrants have long departed come autumn, robins are especially conspicuous in winter. The males (which look the same as the females) maintain their territories all year round and are still singing in our gardens when most other songbirds have fallen quiet for the winter. Their distinctive red breast assists them in declaring their territory, aggressively stating intent to any prospective rivals. Should a rival fancy his chances then the robin’s cutesy veil falls away as all hell breaks loose. They are extremely intolerant of other and I’ve witnessed these fights a couple of times outside my kitchen window. I’ll admit it’s a little distressing to see two of these cute wee garden pals bashing it out, potentially to the death. But despite the robin’s intolerance and aggressiveness towards its rivals it has nonetheless assumed a cosy familiarity in our lives that few other birds can match. 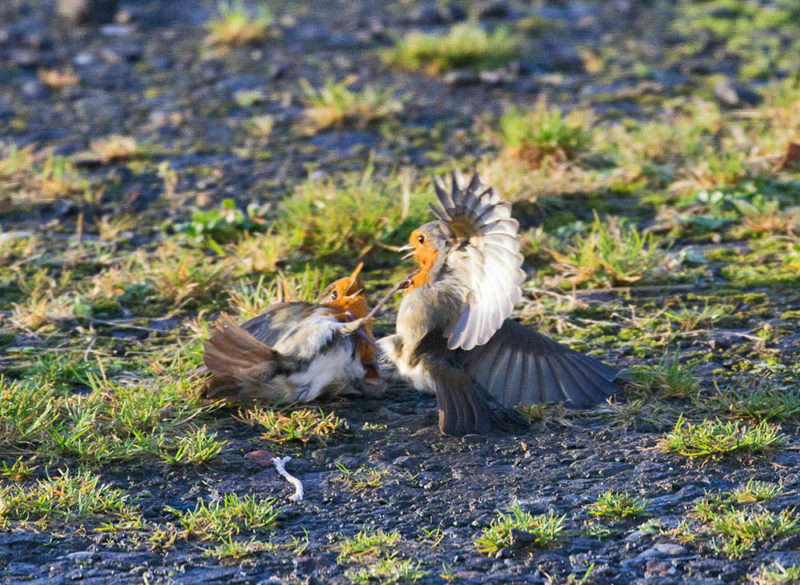 Robins will fight to the death to defend their territories. Even if you pay scant regard to the natural world around you and don’t notice the robins clicking at your heels, you’ve undoubtedly had them in your home this winter. Barely a year goes by when a Christmas card decked with a robin doesn’t fall through your letterbox, as the bird has been a hallmark of the greetings card industry for around 150 years. The image of the festive robin is so engrained that we don’t question it, but the most delightful explanation for its origin is that in 1840 the first public postal service began and, in its formative years, its pioneering postmen all wore red jackets. Before long, the posties had been nicknamed ‘robins’ by an affectionate public and they themselves started appearing on seasonal greeting cards….albeit in bird form. That symbolism has long since been forgotten but the image itself remains on the cards to this day, which is fine by me because the robin suits the traditional winter scene well – a defiant and welcoming flash of red in an otherwise monochrome white world, its puffed up winter plumage resembling a colourful bauble for your Christmas tree. That said, when the mild British winter sees fit to buck convention and actually deliver a white Christmas of the Dickens variety and a protracted cold spell, the robin population suffers badly. 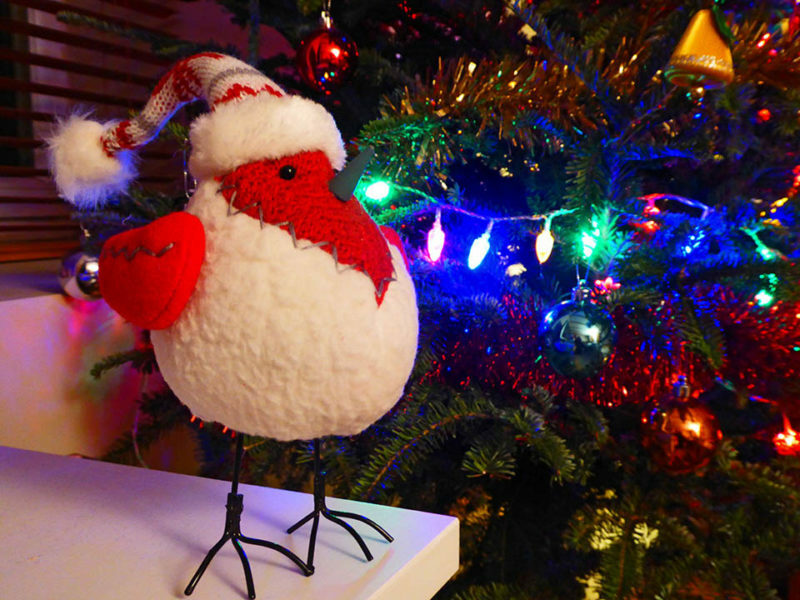 Most of us have robin-shaped tat in our homes during Christmas. I certainly do! But our relationship with the robin, or ‘ruddock’ as it was once known, goes way beyond festive tat. As a ubiquitous bird that is present all year round and has a high tolerance of, or indeed relies upon humans, it’s only natural that it would unwittingly have been woven into our beliefs and traditions. For example, do not injure a robin. Doing so could result in one of your hands shaking for the rest of your life, one of your fingers going crooked or, at the more extreme end of the spectrum, whatever injury you inflict upon the robin will also happen to you. You should certainly never kill a robin nor should you entice one into your home, as that is considered bad luck. And if a robin raps three times on your window then…..well…..let’s not go there. Those are a tad morbid so let’s turn the mood around by mentioning the optimistic folk who make a wish on the first robin of the spring. And if you like a man in uniform then keep your eyes sharply peeled on 14th February because apparently if you spot a robin on St Valentine’s Day then you’re odds-on to marry a sailor. Don’t get too excited though, because given there are millions of robins in the UK I’m not sure there are enough sailors to go round. Folklore like that perhaps explains why the robin has twice been voted Britain’s national bird. First in 1960 when someone or other declared it so and again in 2015 when 200,000 people voted in an online poll **. Sadly though, despite spending a whole day rummaging around the interweb I failed to find any superstitions pertaining to robins in the boots of cars. But because it seems that pretty much ANYTHING can be attributed to the robin I feel entirely justified in starting a superstition of my own. My car park robin won’t be a harbinger of doom, though. It won’t be the dead paying me a visit or a sign that I’ll be moving to Portsmouth. Nope, mine will be entirely benevolent. My robin will be cheery hill spirit come down to offer me thanks for spending time in the hills, for doing so responsibly and, if it cheeps, then it is bidding me a safe trip home. One splendid plump red full-stop to mark the end of my hillwalking day.